Since it's still kind of dreary looking outside my window, I can only imagine what my garden will be like this Spring. I am imagining beautiful butterflies and brightly colored flowers. Ahhhhhhh...I can almost smell those flowers. 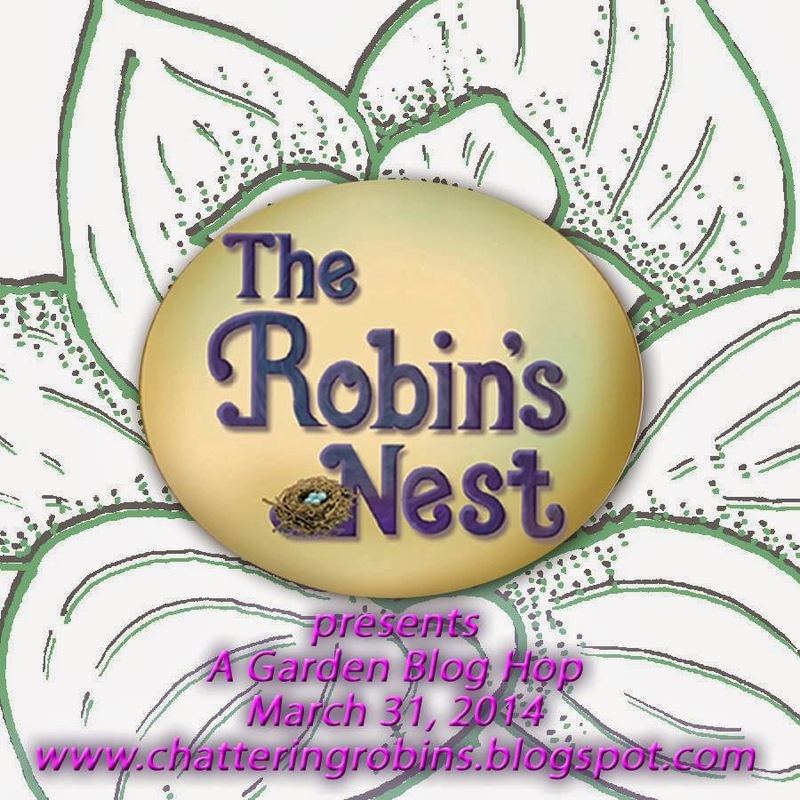 Today I am participating The Robin's Nest Garden Blog Hop. The challenge is to make a project featuring something in your garden. 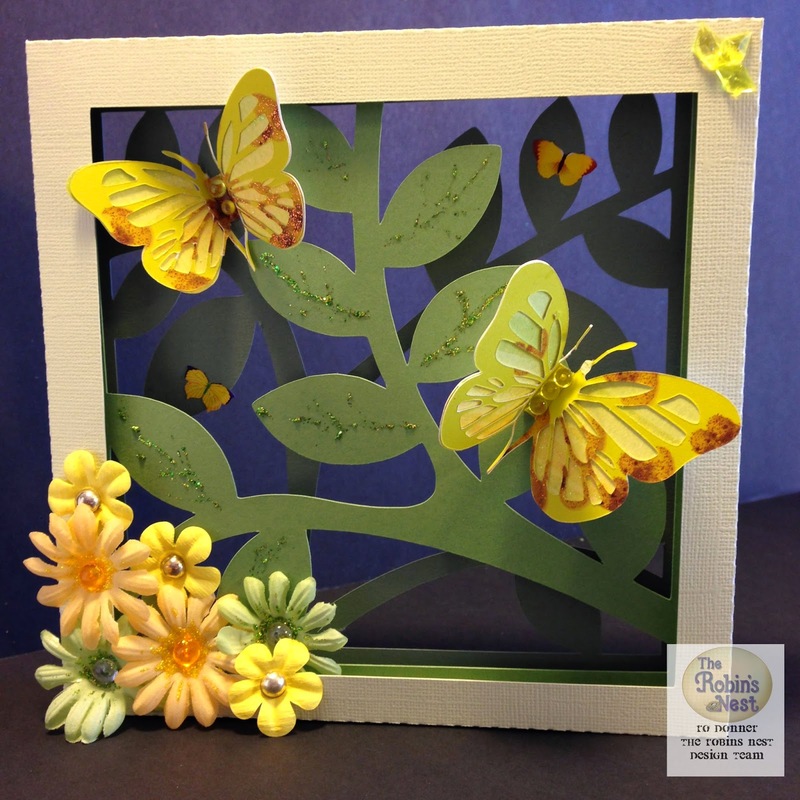 I hope you will join along in the hop... there is a fabulous $15 Butterfly Kit giveaway from TRN for visiting and commenting on the blogs in the hop. And as a special treat and to thank you for visiting my blog, I will be giving away to one random winner an bag of assorted Dew Drops! I will pick the winner at 12PM (EST) on Sunday, April 7th. 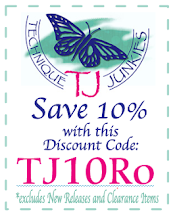 You must post a comment and be a follower of my blog to be eligible. Are you anxious to see my project yet? Well, I'm anxious to share it with you. 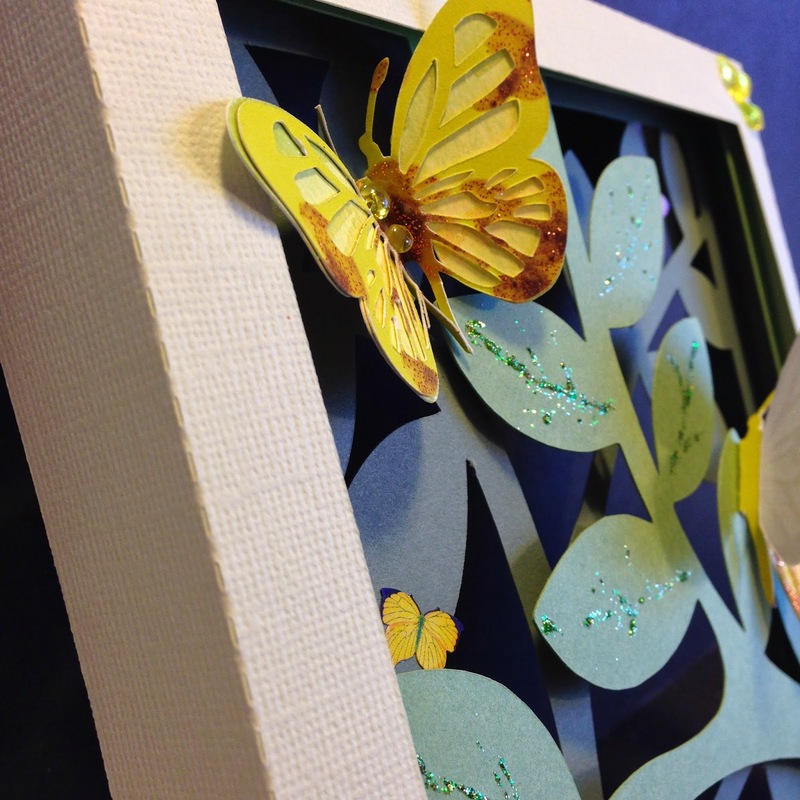 It is a 3D Butterfly Box. 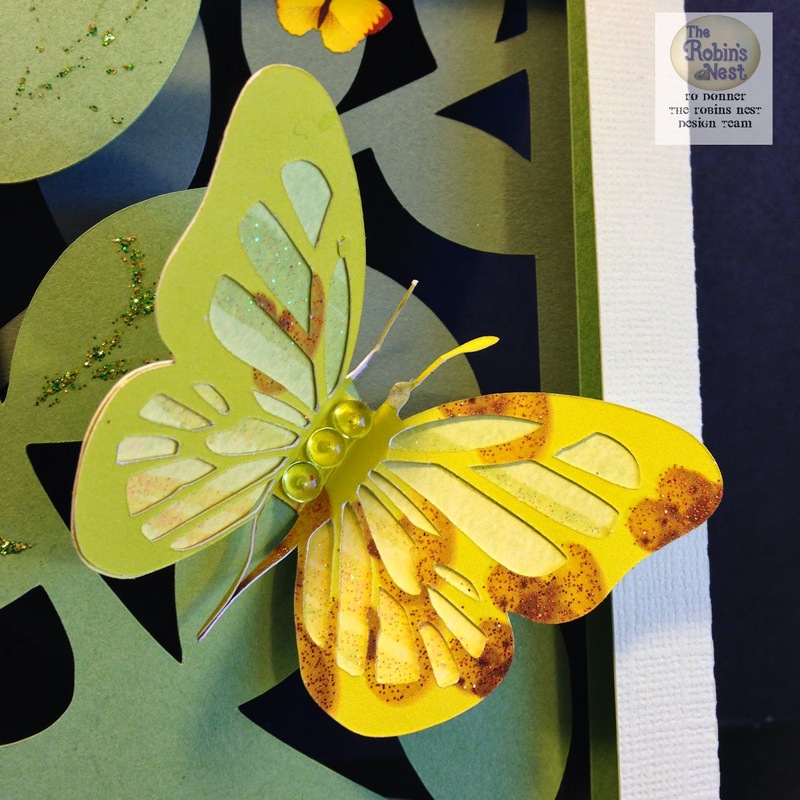 The butterflies were cut using the absolutely gorgeous glitter papers from The Robin's Nest. You would never guess that the body and outline of the butterfly is duck paper! 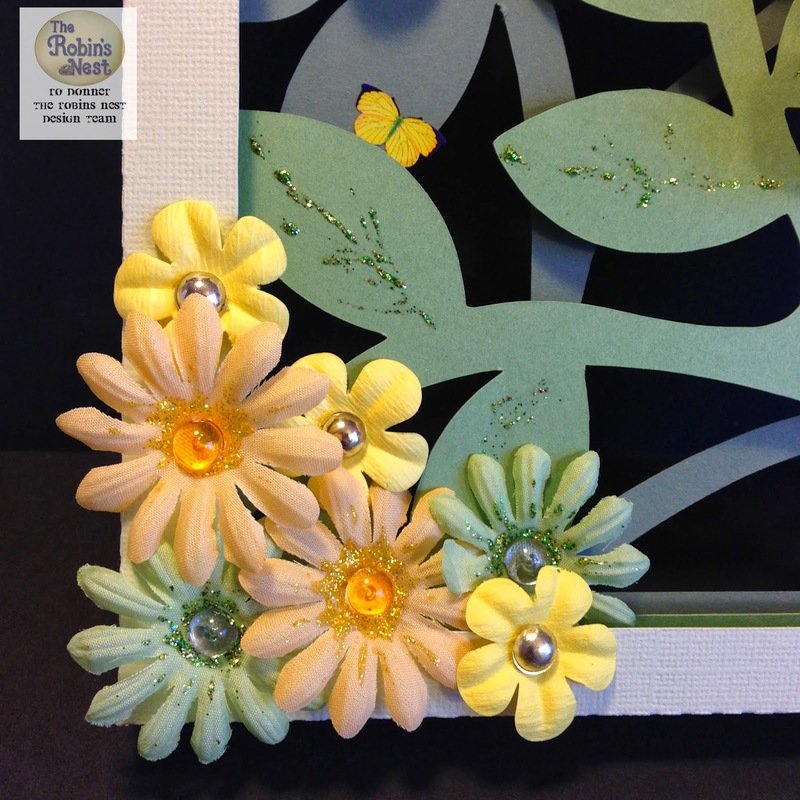 I used a shadow box kit from Silhouette designed by Ashbee Design. You can find the links at the bottom of this post. If you would like to see the directions on assembly of this project, you can check out the link at Ashbee Designs. One of the nice things about this shadow box is that it does not have a solid back, so your wall color shows through nicely. I have it hanging on my craft room wall and it sure is cheerful! 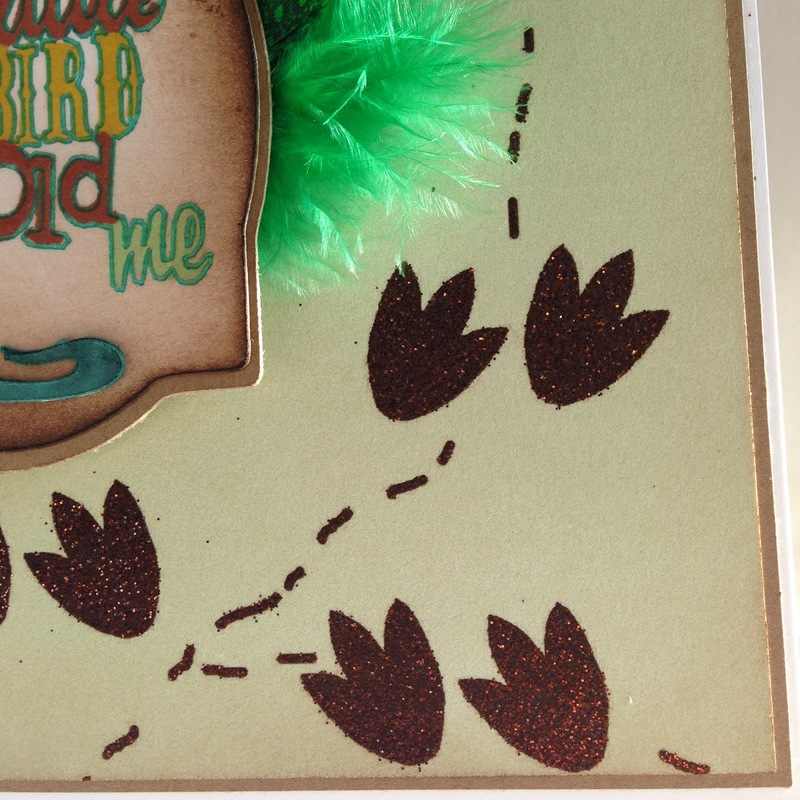 Now, if you haven't already been there, head on over to The Robin's Nest for the blog hop! Hope to see you there! Happy Birthday, Sarah (aka Barney)! 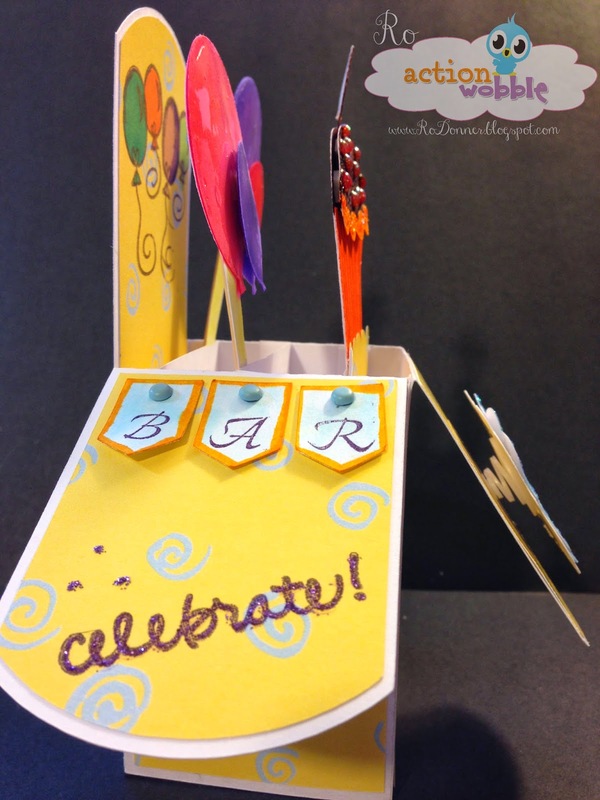 I love a good reason to make a card, like a Birthday! 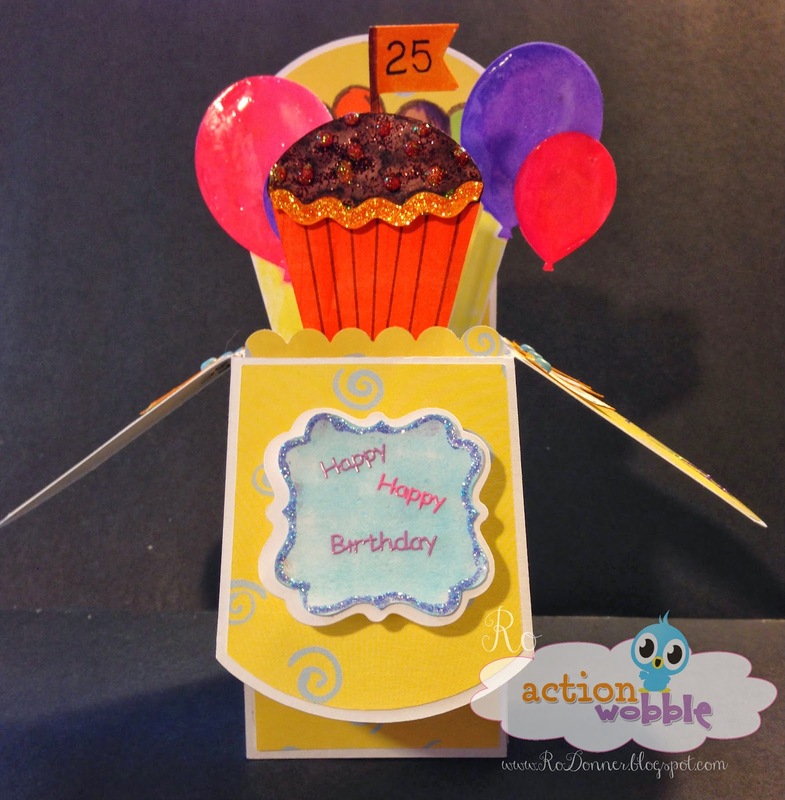 And I love making birthday cards fun, like adding Action Wobbles! 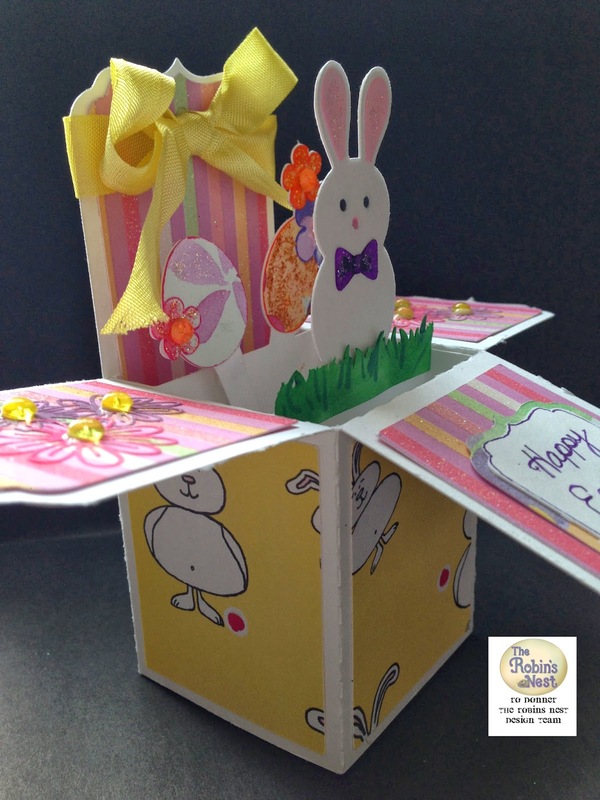 And when you combine a Pop-Up Box Card with an Action Wobble, you get a really fun card! Gotta love the wobble! 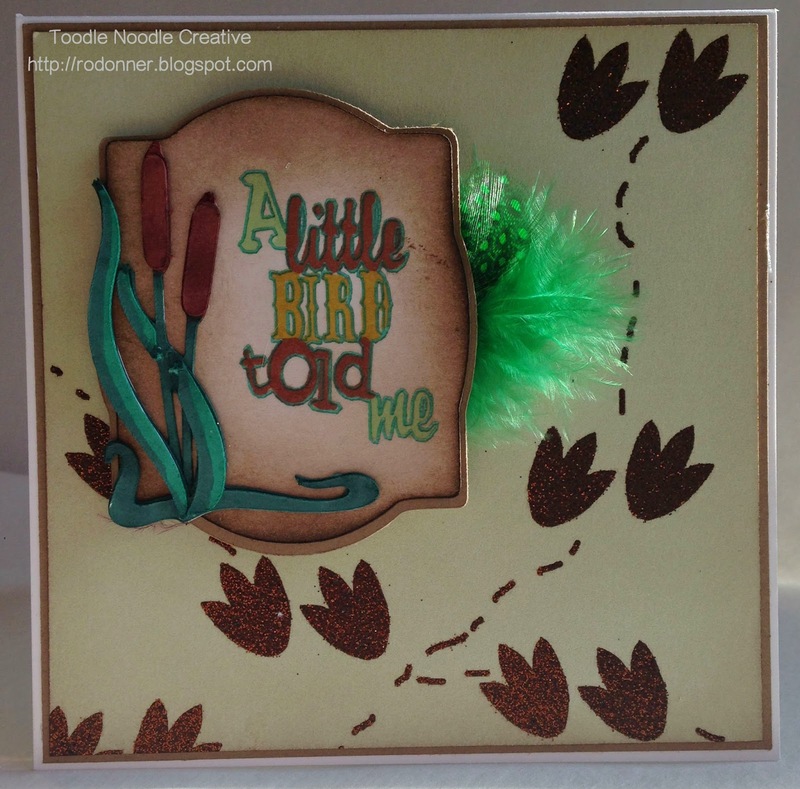 If you would like details on how to make this card, there is a tutorial here. Or you can download a cutting file from the Silhouette online store if you happen to have a Silhouette. If you would like to see a similar card that I prepared with pictures from start to finish, check out my post here. 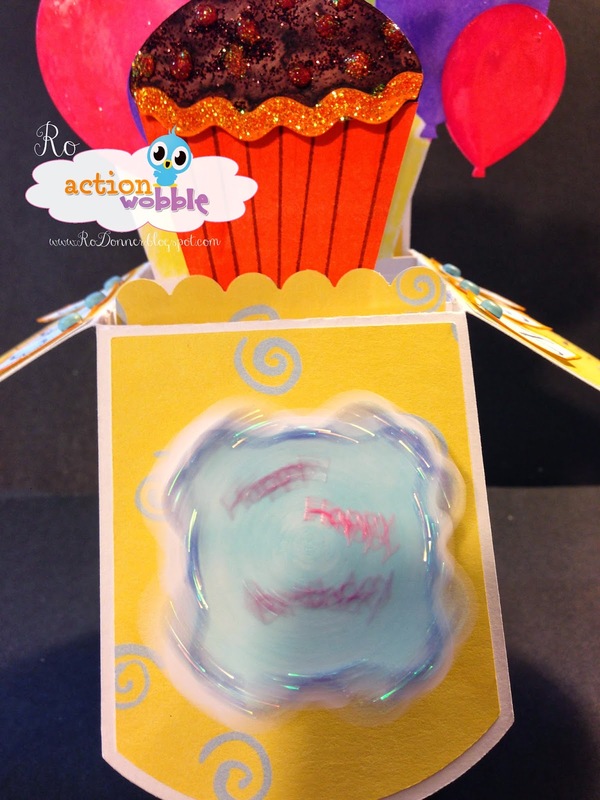 I hope you join us over at Action Wobbles for our Wobble Wednesday Challenges. They are lots of wobbly fun! And if you would like to purchase some of these wobbles for your very own, visit The Scrapbooking Queen on Facebook. Til next time, keepin' in crafty. I have a couple of new projects posted on The Robin's Nest blog. Full details can be found there. Links to the supplies used in these projects can be found at the end of this post. My first project is a 3D Box Card. 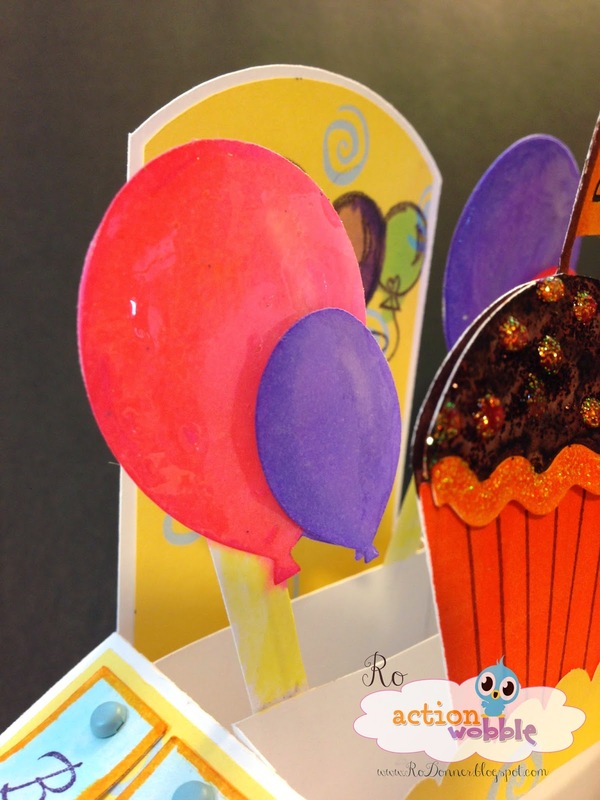 These cards are so fun and they fold flat for mailing in an A2 size envelope. 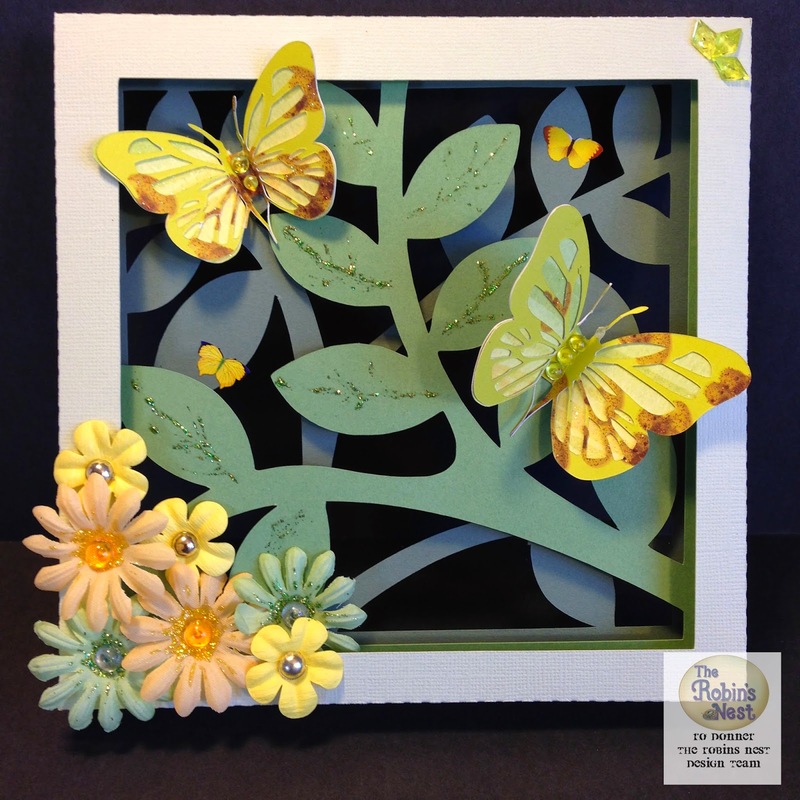 I used a cutting file from the Silhouette Store and some beautiful Robin's Nest papers. Aren't these box cards adorable? I think I will be using these a lot! My second project features some beautiful artwork from Altered Pages, along with some beautiful glittery paper from The Robin's Nest. 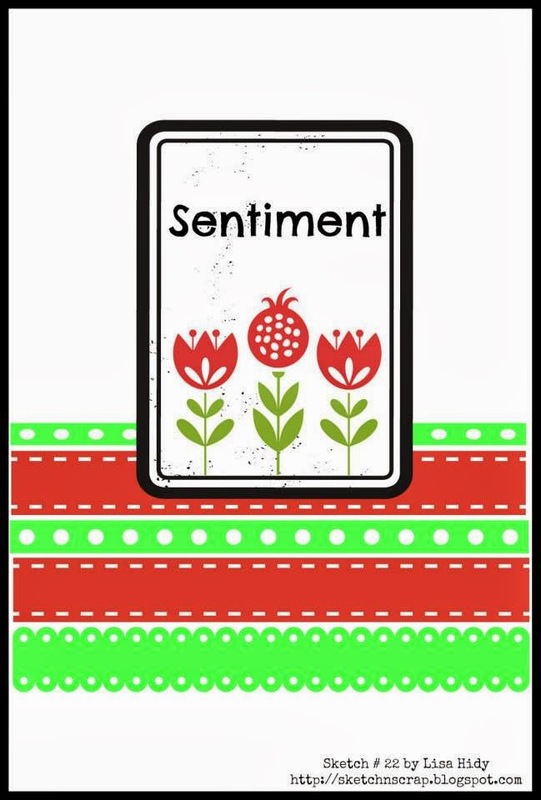 Coming up on March 31st, The Robin's Nest will be hosting a Garden Theme Blog Hop! I sure hope you will join us! It should be a lot of fun and there will be some great prizes along the way! So be sure and check back! I would love for you to visit The Robin's Nest and see my full post. There are a lot more pictures and details. If you would like to purchase this card or any of my many other cards, I have them listed on my Facebook Page: Toodle Noodle Creative. I would be thrilled if you would like my page when you visit. FCCB #203 - BYE BYE BIRDIE! Which is perfect, since our sponsor is The Robin's Nest! 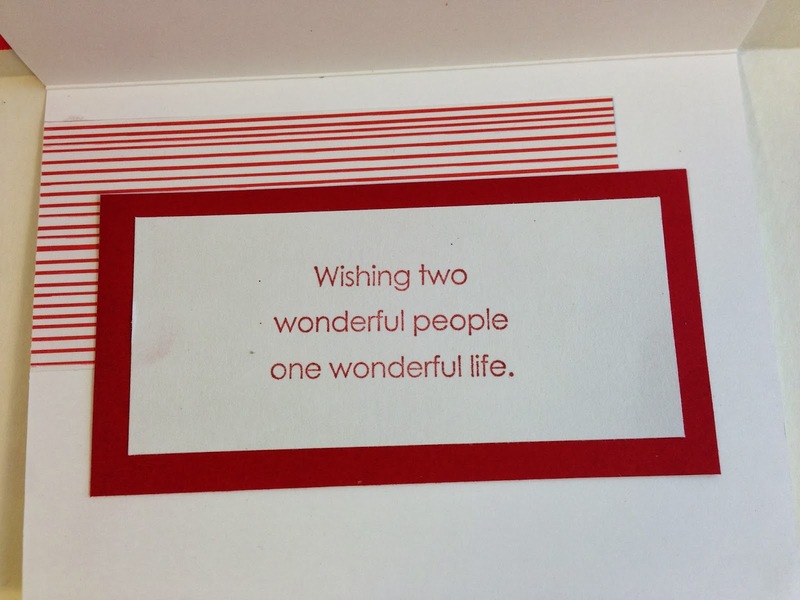 I am very fortunate to serve on the Design Teams for both Fantabulous Cricut and The Robin's Nest. So my project this week gets to highlight both! I started with a 5"x5" card base and matted it with some kraft cardstock. 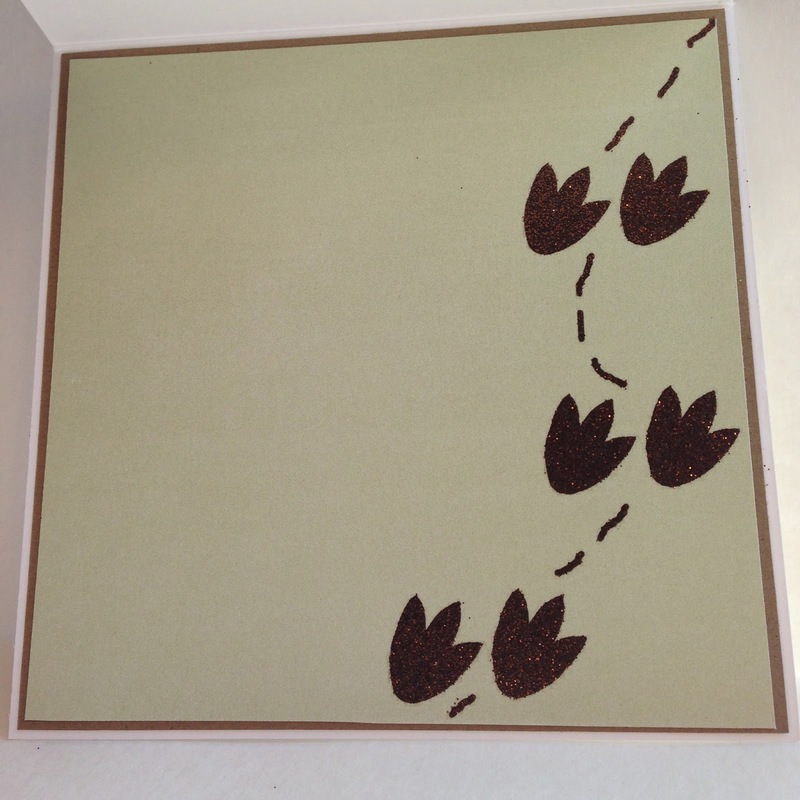 I added a piece of Robin's Nest paper (Leaf Stripe - reverse side), which, to me, looks like duck footprints. Don't you just love the brown glittered print? I then cut from kraft cardstock Scallop 6 from Ribbons & Rosettes for my base frame. The rest of the cutouts are on a heave white cardstock (Recollections). I've gotten to really like cutting my layers out of white cardstock as I can better control the colors with my Spectrum Noir Markers. Not sure why the color in this photo is so off! Sorry about that! Anyhow, the cattails are from the Art Nouveau cartridge. And the sentiment is from Just Because Cards. Using a gel pen and holder from Cri-Kits, I printed the sentiment on some white cardstock and then cut another Scallop 6 (just a smidge smaller than the first one). I colored in the letters with markers and inked the frame with some Walnut Stain Distress Ink. I then attached that to the base frame. The cattails were assembled and adhered to the frame. I added a couple of pop dots on the back. I added a couple of green feathers under where the frame would be and then attached the frame. 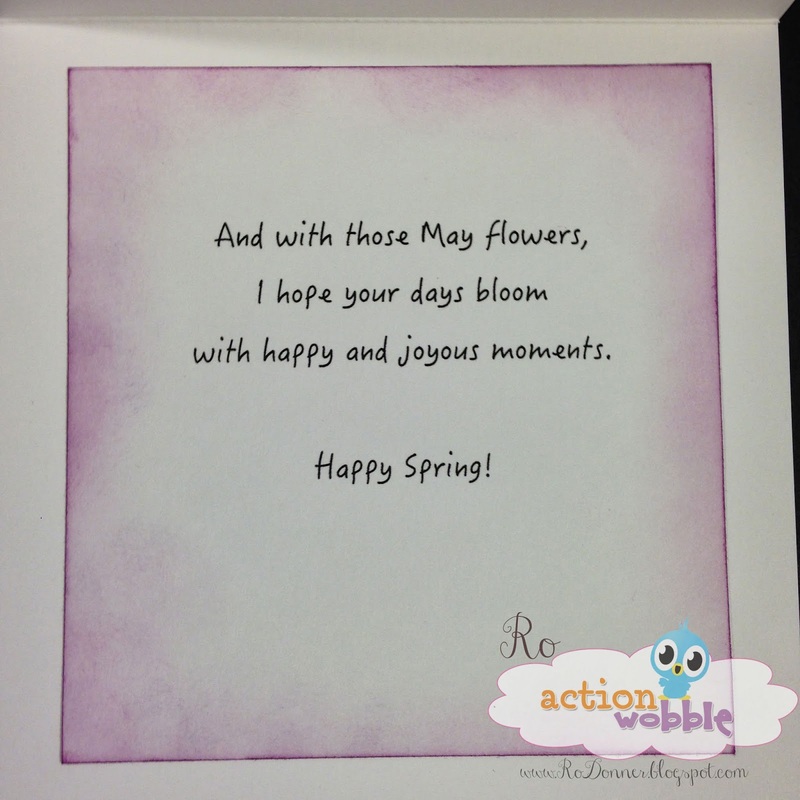 For the inside of the card, I mimicked the layers from the front and left it sentiment-free. That way, I can customize it for any of several occasions. A little bird told me....It's your birthday!, or Congratulations are in order!, or You were a little under the weather!, etc. Hope you enjoyed my project today. If you are interested in purchasing this, or any other of my cards, feel free to visit my Facebook Page. 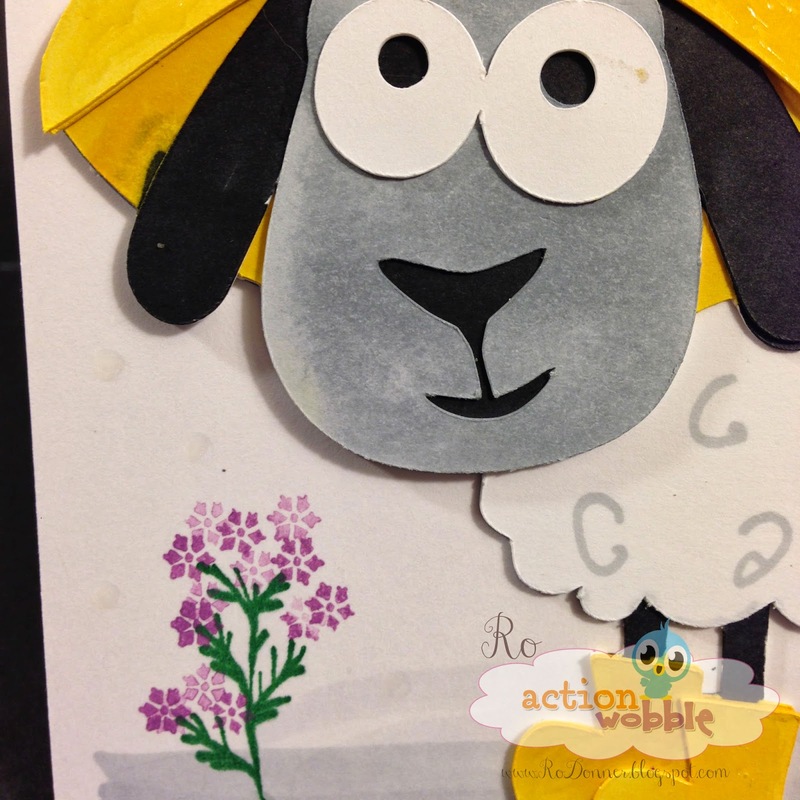 It may not be sunny and flowery outside, but that doesn't mean we can't bring some spring to our cards! 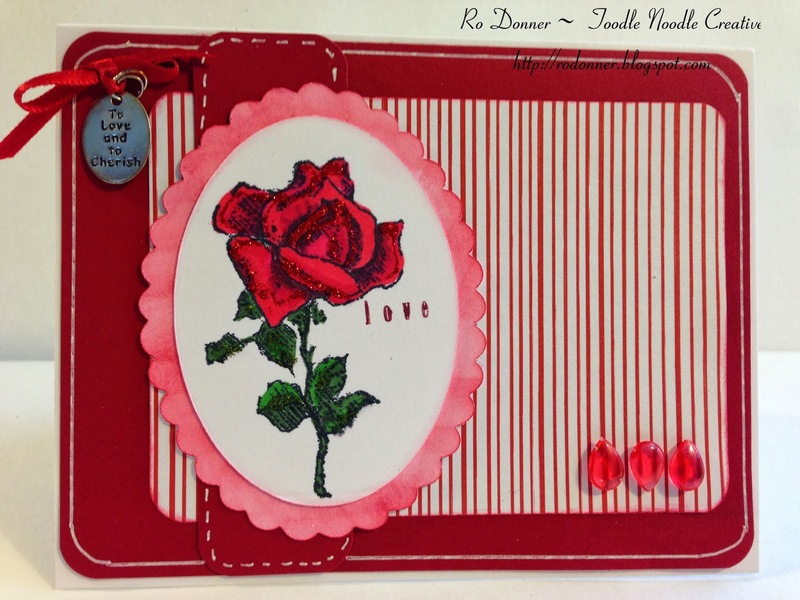 Our sketch this month at Sketch~N~Scrap inspired me to do just that! 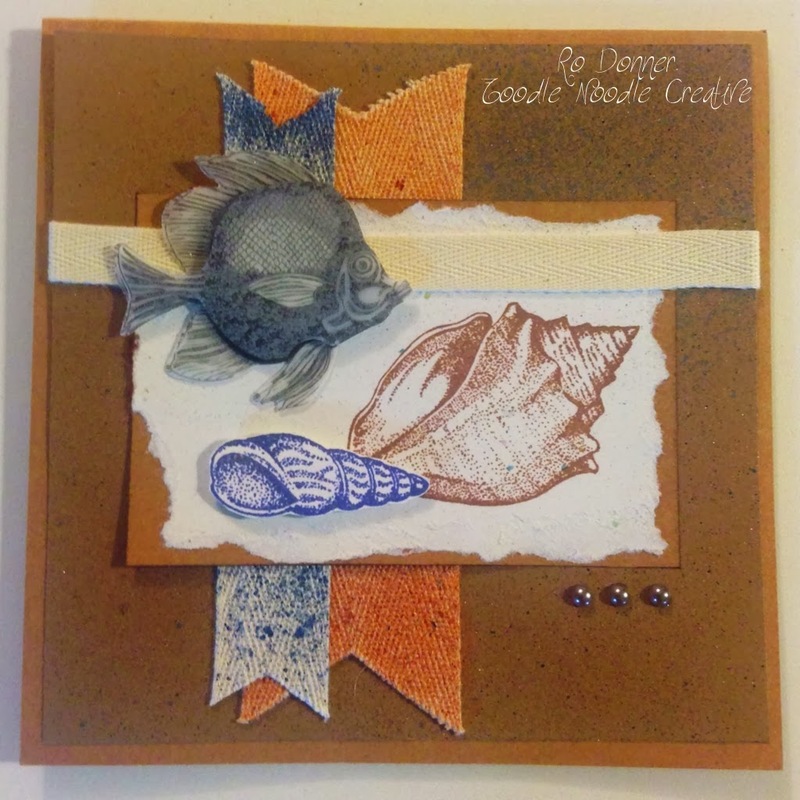 I had some vellum tape in my stash, I think it's by Flavia, and the colors and patterns were just perfect for the card I had in mind. 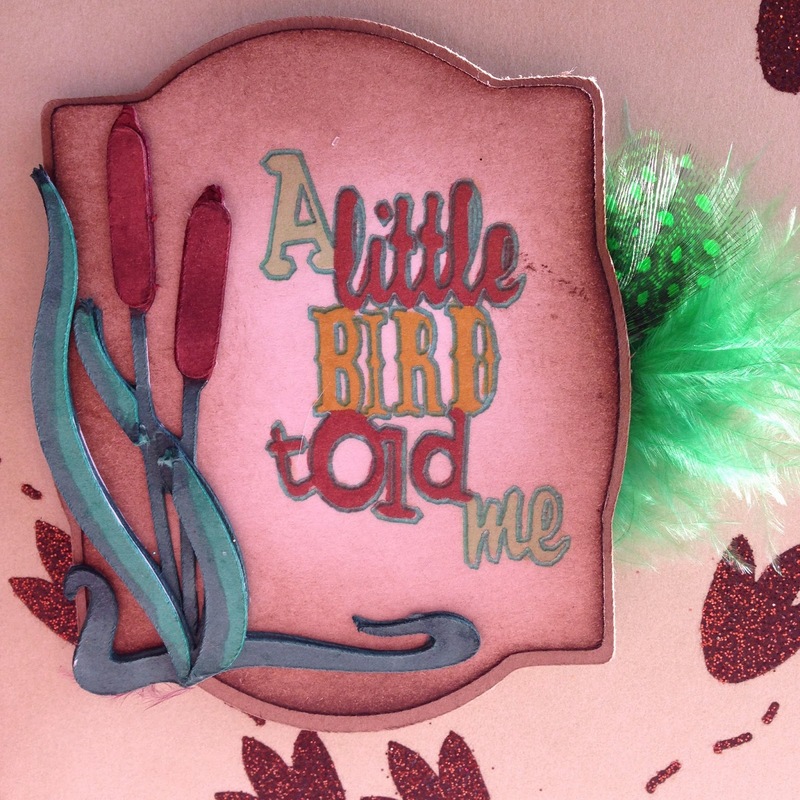 I used some Spellbinders dies and cut out two pieces, one green and one white. While still in the die, I sponged some green ink around the edges of the white piece. In that same green, I stamped the sentiment. 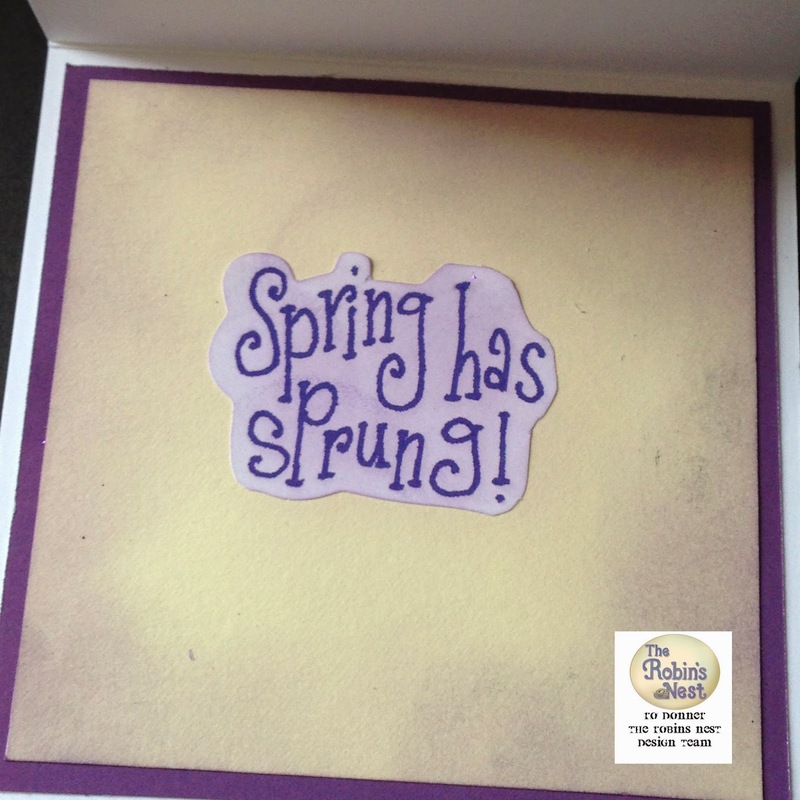 The flowers (Stampin' Up!) were stamped in bright pink. The clip and ribbon were added as a perfect accent. Actually, I didn't have the right color orange ribbon, so I used white and colored it with orange ink. 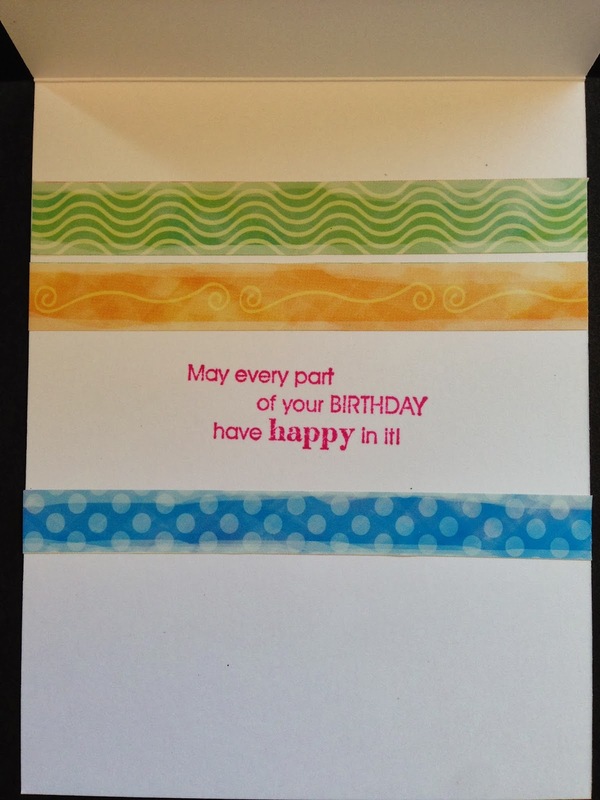 For the inside of the card, I added a simple birthday greeting along with a few more strips of the vellum tape. 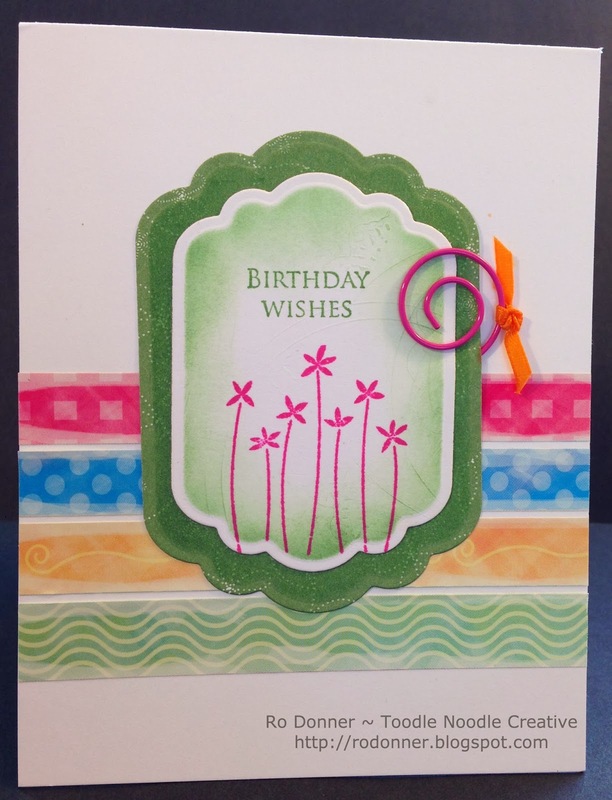 Such a bright and cheery card, and so quick and easy to do. 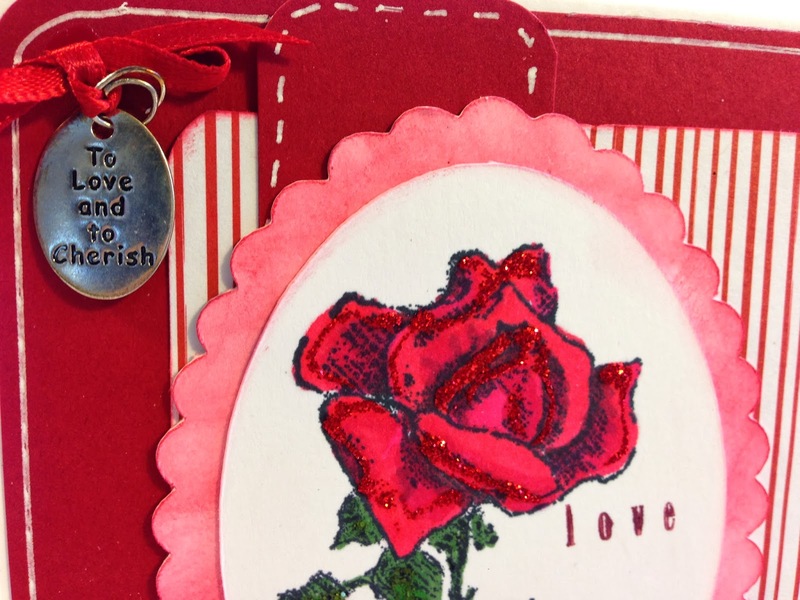 I hope you'll join us at Sketch~N~Scrap for this card challenge. Head over there now and see all the great inspiration from the Design Team. We'd love to have you play along! And hello to all you wonderful wobble-lovin' folks! 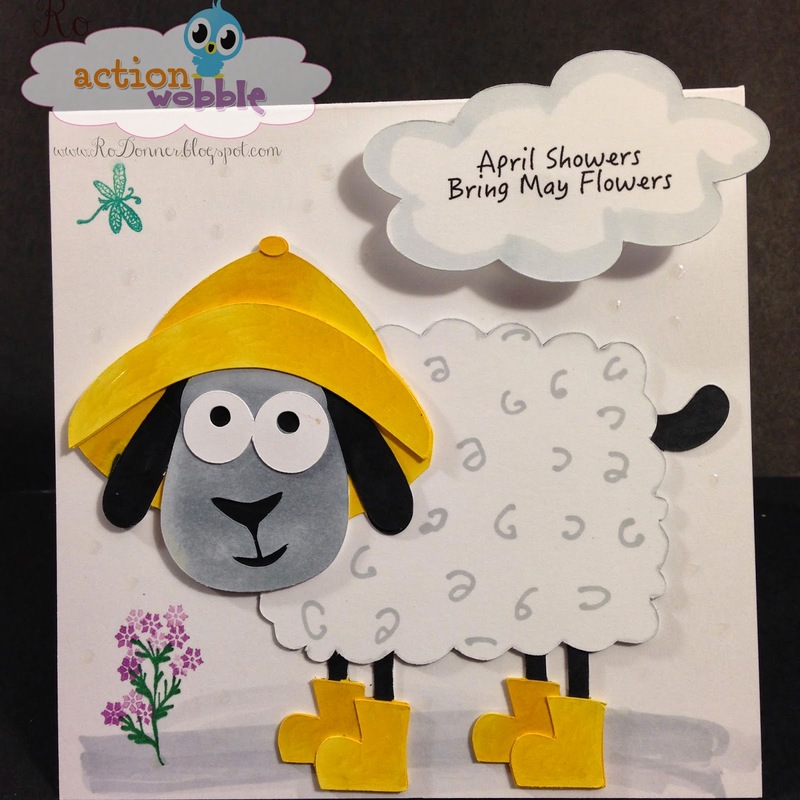 I have a fun card to welcome Spring...just for EWE! To make my card, I started with a 5x5 card base. 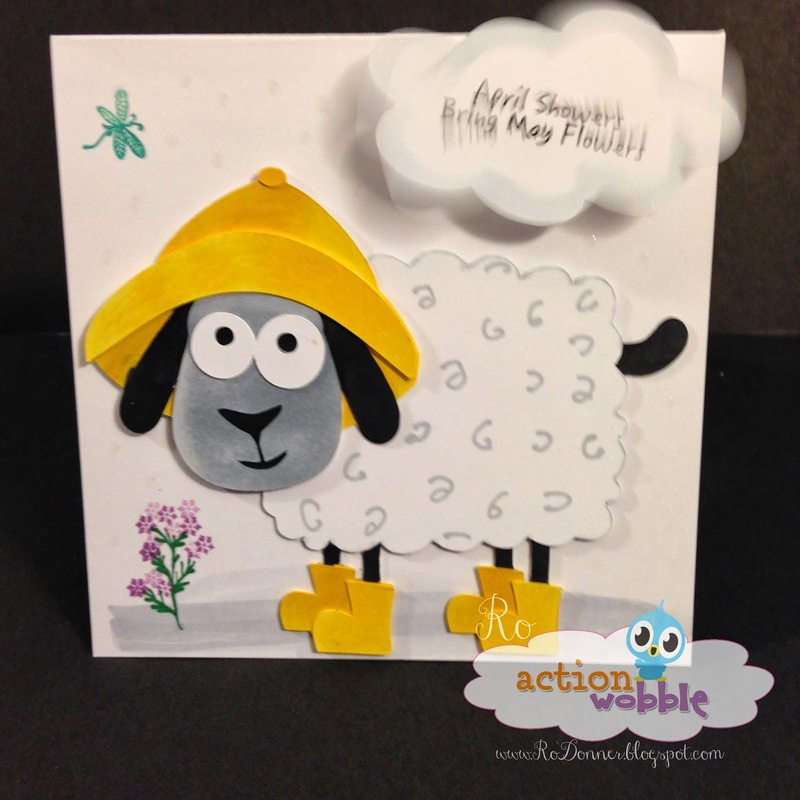 Using my Silhouette, I cut the adorable sheep (Rainy Day Sheep by Lisa Norris, #56613) out of heavy white cardstock. I use white cardstock so I can better control the colors of the elements using Spectrum Noir markers. 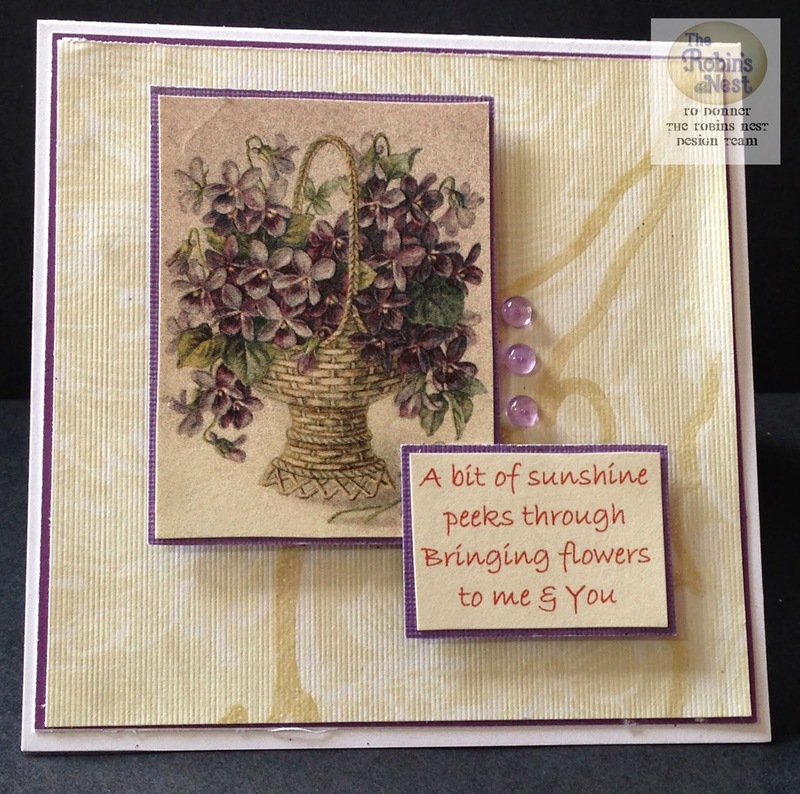 To make the flower, I stamped the stem using a stamp from Stamps by Judith, and a flower from Rubber Stamp Tapestry. The dragonfly is also RST. I added a computer journaled sentiment in a cloud that I designed in Silhouette by merging two flowers together. 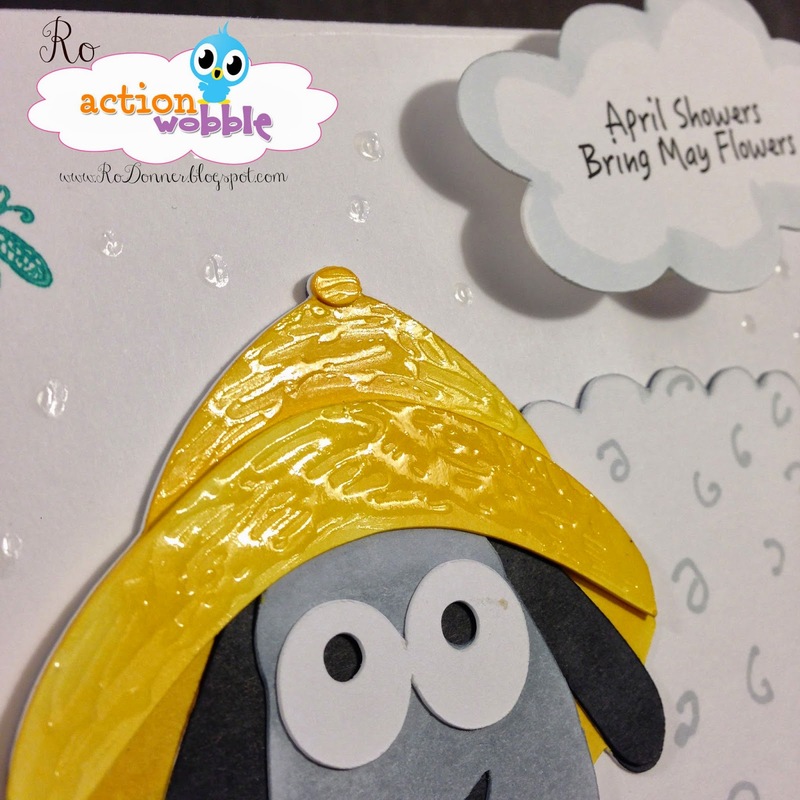 I added an Action Wobble so the cloud could sort or shake out the raindrops! Glossy Accents were added to the hat and boots, and I created some shiny raindrops as well. For the inside of the card, I added another computer journaled sentiment on white cardstock with the edges inked. 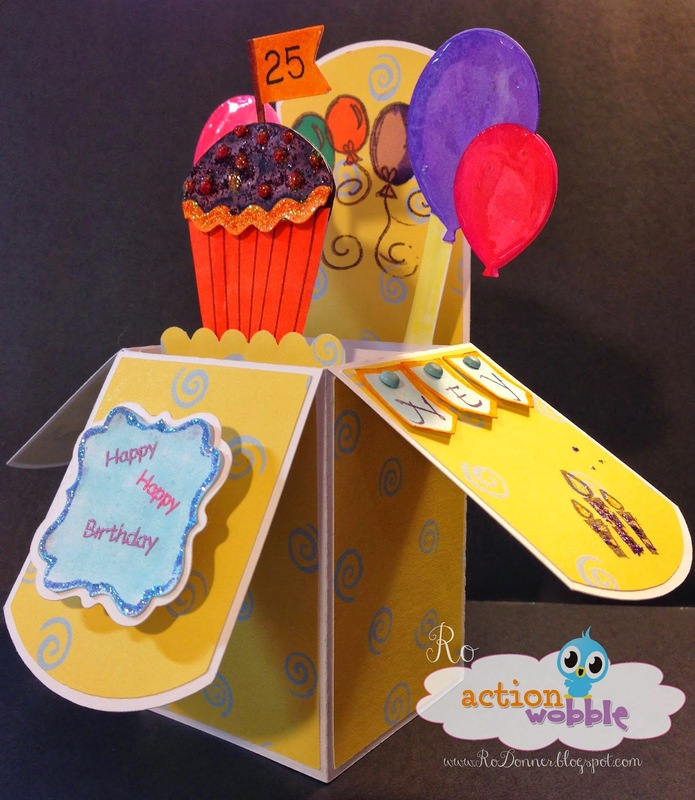 I hope you enjoyed my card and are inspired to try some Action Wobbles, which can be purchased from The Scrapbooking Queen. 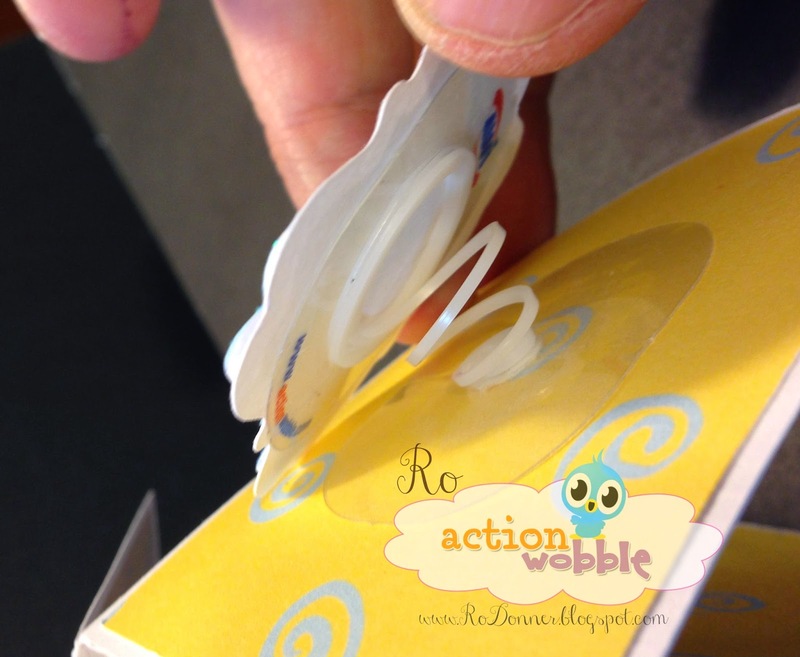 And join us over at Action Wobbles every Wednesday for our Wobble Challenges! So much fun. So many ideas. 3D Duckies and a Bundle of Bunnies! Hey, friends. Happy Thursday! 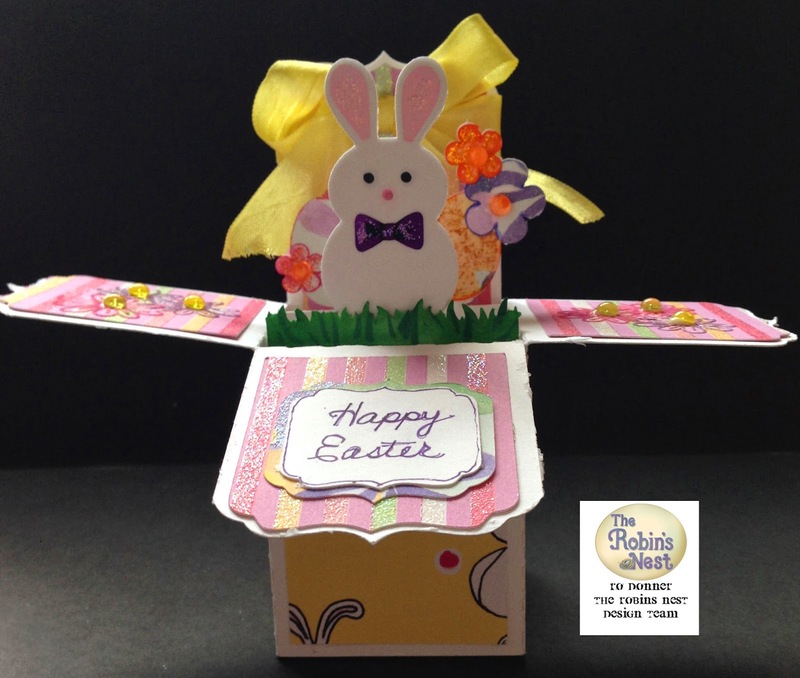 Today over at The Robin's Nest, I am sharing a couple of Easter cards that have been made using the beautiful papers from the Spring Collection (20% off all month! ), and some digital prints from Altered Pages. 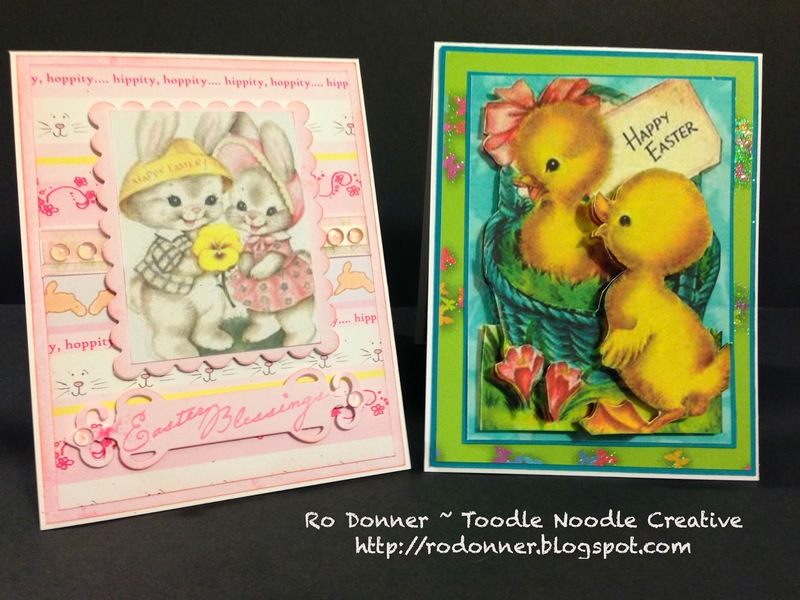 If you would like to see more pics of this cute card duo, then head on over to my post at The Robin's Nest! You will find lots of great ideas, inspiration, and products. And at the end of the month, there will be a great blog hop! I hope you will pop over there and check it all out! 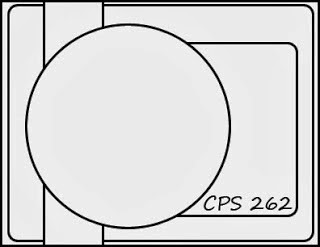 This sketch is from the now defunct Card Positioning Systems. So, for my project this week, I decided to do an oval rather than a circle. I used Create A Critter 2 and Cricut Craft Room Basics to cut the oval and the scalloped oval for my main focal image. I thought I might need a few getting married kind of cards this year (I think I know of three or four weddings already). 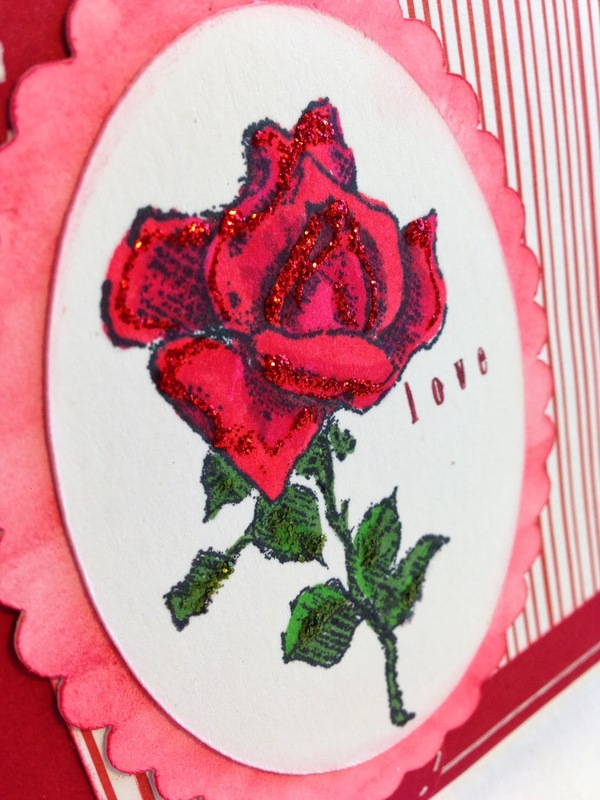 I stamped the rose and colored it with Spectrum Noir markers, then added a little bling with some Stickles. I found the perfect charm in my stash and attached it with a piece of red ribbon. 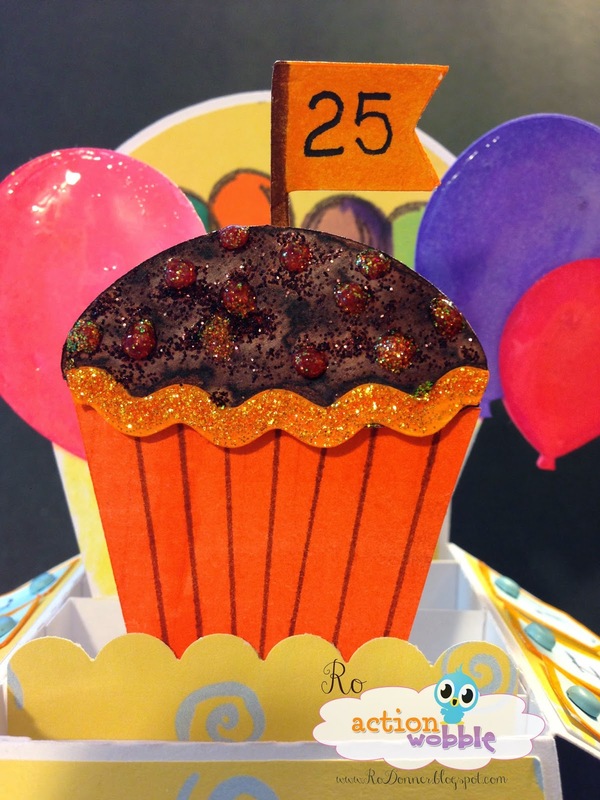 The lower corner gems are Dew Drops from The Robin's Nest, and they balance out the card nicely. I added the white faux stitching and lines with a white gel pen. In this next pic, you can really see the glitter from the stickles. For the inside of the card, I added a little more paper used on the front of the card and a nice sentiment from Stampin' Up. Hope you come play along with us. Sketch challenges are so much fun. The design is there, all you have to do is pick the papers, cuts and embellishments you want to use. Feel free to turn the sketch sideways for a different look.